Various size pushbikes are available including adult, children, three wheeler, adult with child seat and Electric Bicycles. Helmets and bike locks supplied. Vehicles - small, medium and large all fitted with automatic transmission, air conditioning and power steering. They also have utilities and 12 seater buses (with wheelchair access). 12 Seater bus hire, drive on car license. Wheelchair access bus available. 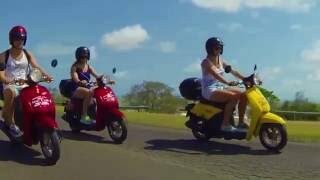 Hervey Bay Rent A Car also have automatic scooters that can be ridden on a car license.